The top 4 teams – Police United, Verdes, Belmopan Bandits and BDF are all very well matched, and after the first weekend of playoffs, it is still anybody’s guess as to which two will make it to the championship finals. In the playoff opener on Saturday night at the Isidoro Beaton Stadium in Belmopan, it was home squad Police United coming away with a 2-1 win over defending champs Belmopan Bandits in a game that could have gone either way. There were a number of close calls on either side, with the hundreds of fans in attendance filling the air with applause or groans on the scoring of goals or near misses, respectively. As evenly matched as the teams were, it came down to a matter of errors and a bit of luck that determined the final outcome. Police got on the score card first, when a misplayed clearance by a Bandits defender saw an alert Franz Vernon in the Police forward line pouncing on the opportunity, and in a spit second unleashed a left foot rocket into the upper right corner past a diving Woodrow West in goal for the Bandits. 1-nil, Police, at the 29th minute, and it stayed that way into the intermission. After the resumption, the Bandits quickly inserted forward/midfielder John King in place of midfield/defender Khalil Velasquez, to try and create more chances in attack. And they were rewarded a few minutes later, at the 65th minute, when a long Denmark Casey free kick from the left side rebounded out to Jarro James at the edge of the eighteen, and he rifled a right foot shot past Police’s goalkeeper Keith Allen, to knot things up, 1-1. Police responded with two quick substitutions, getting some fresh legs in forward and midfield, with Marlon “El Matador” Meza replacing Franz Vernon in front, and Trevor “Burger” Lennen for Cafu Roches in midfield. Belmopan countered a minute later with David Madrid replacing Highking Roberts in the forward line. 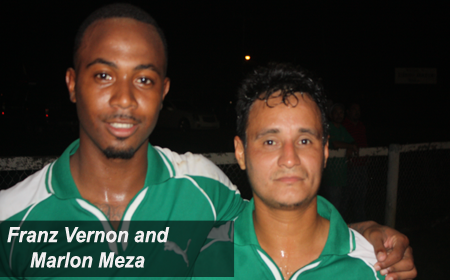 Goals: Police United – Franz Vernon 29’, Marlon Meza 81’; Belmopan Bandits – Jerome James 65’. Belmopan Bandits FC: #1 Woodrow West (goalkeeper), #11 Khalil Velasquez (#8 John King 58’), #15 Jeromy James, #12 Denmark Casey, Jr., #16 Jordy Polanco, #4 Elroy Kuylen, #9 Highking Roberts (#10 David Madrid 77’), #6 Evan Mariano, #24 Dalton Eiley, #23 Tyrone Pandy, #5 Shane Armstrong. Coach – Edmund Pandy; asst. Jorge Nunez. Police United FC: #00 Keith Allen (goalkeeper), #10 Harrison Roches (#12 Trevor Lennen 76’), #9 Lennox Castillo (#7 Ralph Flores 85’), #20 Daniel Jimenez, #22 Franz Vernon, Jr. (#8 Marlon Meza 70’), #17 Devon Makin, #5 Kishane Pech, #19 Byron Usher, #14 Andres Makin, Jr., #18 Frank Lopez, #13 Amin August, Jr. Coach – Andres Makin; asst. Amin August. Referee: Irfan Basdemir; assistants Ricardo Ake and Daniel Uh; 4th official Pedro Recinos. Game 2 of the PLB playoffs was another special treat for football fans on Sunday at the Norman Broaster Stadium, where the two combatants in the last regular season game, that had ended 0-0, enough for Belize Defence Force to qualify to the playoffs, would meet again at the same venue. This time home standing Verdes FC had every incentive to win, as did BDF, as every point counts in these playoffs, where the top two points leaders at the end of the double round-robin will automatically clash in the finals. Verdes fans were prominent in their green tops to cheer on their home team; and the BDF fans, who commandeered the north-western bleacher, had their Garifuna drums beating as they chanted their support for the BDF squad. It was another fast and intense ball game, with exciting flurries from young strikers Carlton “Fubu” Thomas of BDF and Gilroy “Bredda” Thurton of Verdes; but both of them only managed to thrill their fans with close misses, and were unable to shake the back of the net. This one was more physical that the Saturday night encounter, and referee Amir Castillas was tested in spots trying to control the action. And as in the playoff opener on Saturday, it was defensive errors that would result in goals, while the few shots were either stopped or sent wide or over the cross bar. It was a long free kick from the left side by BDF sweeper Vallan Symms that drained all the way across to the right side of the Verdes 18 near the southern goal, and, with Verdes defenders paying close attention to BDF strikers Shane “Chucky” Flores and Fubu Thomas, BDF defender Leon “Chow” Cadle got a header on the ball sending it back inside the eighteen in front of goal, where tall BDF midfielder Stephen Martinez got his head on the ball before Verdes goalie Benito Moreira could intercept, and his header was perfectly placed down into the right corner; 1-nil, BDF, at the 29th minute, and that’s how the half ended. In second half, kicking into the southern goal, Verdes had their turn for a lucky break. With the evening sun slanting and sendings its beams directly into the faces of the players in the goal area, Verdes’ Bredda Thurton made a fine run down the right (west) side and, after a couple stalling maneuvers, navigated himself close enough to the eighteen to send a nice lob across goal in the path of the sun; and it caught the BDF defence and goalkeeper looking, but not the charging Jarret Davis from the left side; and Jarret came soaring in like a shark attack, striking the ball as it hit the ground about 10 yards out on the left side, and driving it past goalkeeper Gamboa into the BDF goal; 1-1 ball game at the 56th minute. And it stayed that way until the long whistle. Goals: BDF – Stephen Martinez 29’; Verdes – Jarret Davis 56’. Belize Defence Force FC: #01 Tevin Gamboa (goalkeeper), #7 Carlton Thomas, #3 Vallan Symms, #11 Shane Flores (#17 Jesse Smith 45’); #12 Ricky Rickletts, #2 Victor Nunez, #15 Leon Cadle, #6 Stephen Martinez, #13 Andrew Allen, #9 Harrison Tasher (#23 Paul Nunez 66’), #10 Osmar Duran (#16 Russell Cassanova 53’). Coach – Charlie Slusher; asst. Jerome Serano. Verdes FC: #11 Benito Moreira (goalkeeper), #10 Jarret Davis, #7 Nahjib Guerra, #12 Eduardo Gongora (#13 Humberto Requena 80’), #3 San Mendez, #9 Gilroy Thurton, #8 Ricardo Jimenez, #24 Orlando Jimenez (#23 Marlon Molina 77’), #19 Evral Trapp (#17 Jamil Cano 45’), #34 Ryan Gill, #6 Rodney Pacheco. Coach – Marvin Ottley; asst. Walter Salazar. Referee: Amir Castillas; assistants Wendelle Esquiliano and Denfield Andrewin; 4th official Fahreed Ahmad.